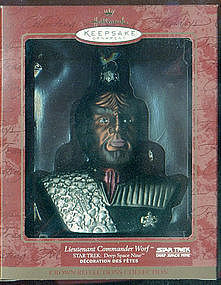 This is the 9 inch figure of Captain Jean-Luc Picard as seen in STAR TREK GENERATIONS movie. Stock number 6141, Collector number 017647. Box is unopened, has price stickers on top and has shelf wear. Priority Mail used with Delivery Comfirmation, which is not included in the price, and postage SHOULD be about $5.50 within the US. 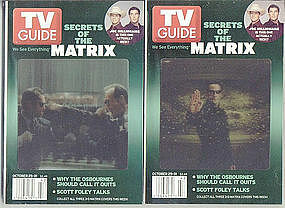 These are the complete set of three TV Guides for the period of 11-17 May 2002 which have the 3-D covers. In Good to Very Good condition. Media Mail rates apply. 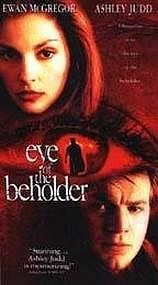 Ewan McGreggor and Nicole Kidman star. Viewed once, not a rental. Media Mail, Del Conformation not required. 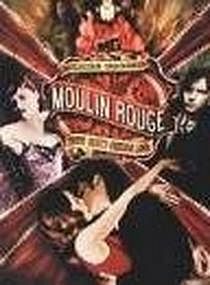 Diane Keaton, Goldie Hawn, Warren Beatty, Andie MacDowell, Garry Shandling star. Factory sealed. Media mail, Del Confirmation not required. $28.00 Sold! You missed it! 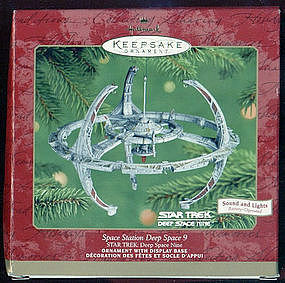 This is the 2000 Star Trek: Deep Space 9 Space Station. Opened once but never displayed. Sound and Lights battery-operated. Original price was $32.00. Priority Mail w/Del Confirmation. SOLD SORRY you missed it? 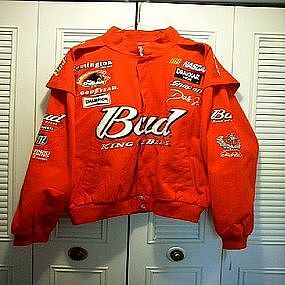 NEW Chase Dale Earnhardt Jr Budweiser Nascar Jacket, size Adult Extra Large, Hear that these sizes run bigger than stated, Has Chase tag on sleeve. Recommend Priority mail with Insurance & Delivery Confirmation. 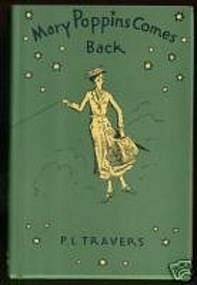 Hard covered novels by P. L. Travers. "Mary Poppins Comes Back" first copyrighted in 1935. "Mary Poppins Opens The Door" and this was first copyrighted in 1943. "Mary Poppins in the Park" first copyrighted in 1952. All three were specially reprinted in 2000 by the Book of the Month Club. Near new condition. Yankees Magazine 2001. 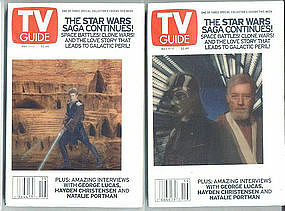 Volume 22, Issue 4-5. 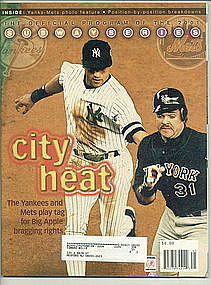 CITY HEAT, Program for the 2001 subway series. Good condition, PO mailing label still attached. 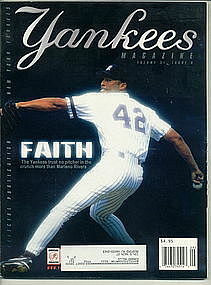 Yankees Magazine 2000. Volume 21, Issue 8-9. Championship Commemorative. Good condition, PO mailing label still attached. 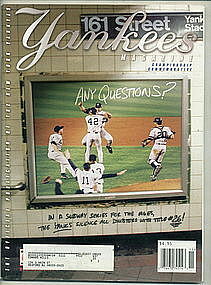 Yankees Magazine 2001. Volume 22, Issue 2. Good condition, PO mailing label still attached. 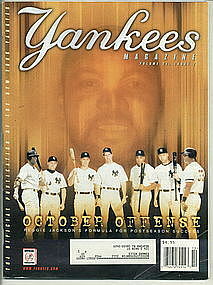 Yankees Magazine 2000. 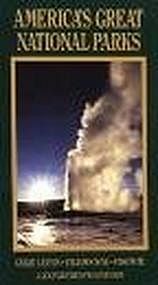 Volume 21, Issue 6. Good condition, PO mailing label still attached. Yankees Magazine 2000. 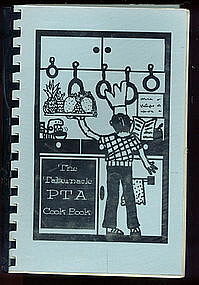 Volume 21, Issue 7. Good condition, has a couple ceases at bottom right corner of front cover. PO mailing label still attached. 160 pages of Meals, side dishes Desserts, etc. Put together to raise money for PTA activities. This is undated.